Super Mario Odyssey hits Oct. 27th, but this Saturday (Oct 21st) gamers will get a chance to try the game out before release. Nintendo is partnering with Best Buy to bring demo locations across the USA. Gamers wanting a taste will have to be quick as the demonstration only runs from 12pm-3pm (local time). Participants will also get a free sticker book (“1 per person while supples last”). Here’s the list of locations to see if you’ll get a chance to try the new triple jump this Saturday. 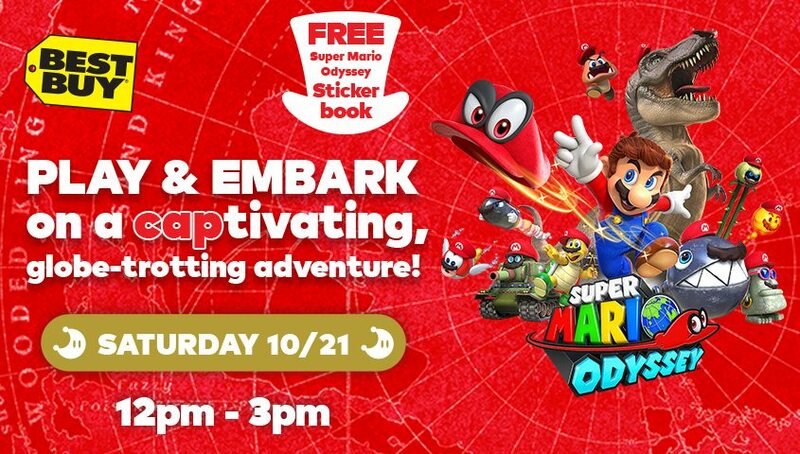 *Must play Super Mario Odyssey demo to receive free sticker book. 1 per person while supplies last. No purchase necessary. Demos available at participating locations. See retailer for more details. Opportunity to play will be on a first come, first served basis, while time permits. Best of luck Nintendo fans!